I lined the bottom and sides of a 23cm spring pan with parchment paper, to ensure that it will come out clean once frozen and you want to get creative with decoration. 1. Place biscuits in a zip lock bag and roll with a rolling pin to crush till you have fine crumbs and then mix with butter/margarine and coconut. Spread it in the bottom of your pan and pat down firmly and place in the fridge or freezer while making the topping. 2. Pour half of the pineapple juice in a microwave bowl and then add the gelatin and let it jellify for approximately 5 minutes. Heat it up in the microwave, till just melted (do not cook it) and then add the remainder of the juice and mix. 3. I made my own caramel. Pour a tin of condensed milk in a small pot, place on the stove top and bring to boil over medium/low heat, stirring continuously to prevent burning. Boil for 5-10 minutes till it thickens up and have the correct consistency of regular store bought caramel. You may not have the same brown color, but that’s not a problem, it will taste the same and work perfectly. Let it cool down before continuing with the next step. 4. Whip the cream cheese and caramel till smooth and creamy and then add the juice/gelatin and whip again. I used an electric hand mixer and it worked well. 5. Add the vanilla to cold cream in a separate bowl and beat till stiff. 6. Fold the caramel mixture into the cream mixture and pour out onto the crust. 7. Place in the freezer. 8. I took it out the following day, but 1-2 hours will also do, and then you can decorate with toasted coconut and tropical fruit, or any which way you prefer. 9. Remember to take it out of the freezer, you can defrost in the fridge, or just leave it out till ready to serve, as it should be thawed and not eaten frozen, after all it’s a cheesecake and not ice cream. 10. 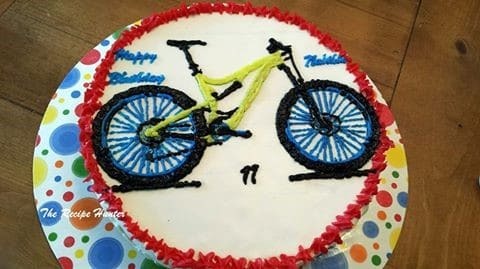 I had a special request from my grandson (his birthday cake) and had to decorate as per the picture. I used Wilton decorating icing. 11. Wow, it’s delicious and everybody loved it and went for a second and third piece of cheesecake.